I try to make the router even better and you can help me by providing feedback, comments, feature requests. If you have questions or feedback about the product, need help with the setup or want to provide general feedback you can contact me. The vYacht WiFi Router is a small 12V low cost, open source board which allows to share marine instrument data by providing a wireless TCP connection to multiple devices. It consists of a base board and with power supply, a wireless module and an isolated NMEA 0183, a combined Seatalk/NMEA or NMEA 2000 module. The following drwaing shows the position of the modules on the board, the board itself and its connectors (for boards pre February 2014 please refer to the manuals). Please always check the board itself carefully as your version might differ. But every input is marked clearly. 1 Wireless module running NMEA processing software on a Linux (openwrt) kernel. 3 Interface module with isolated power supply and signal isolation for ground loop and overcurrent protection. There are various NMEA and Seatalk versions of this module available. 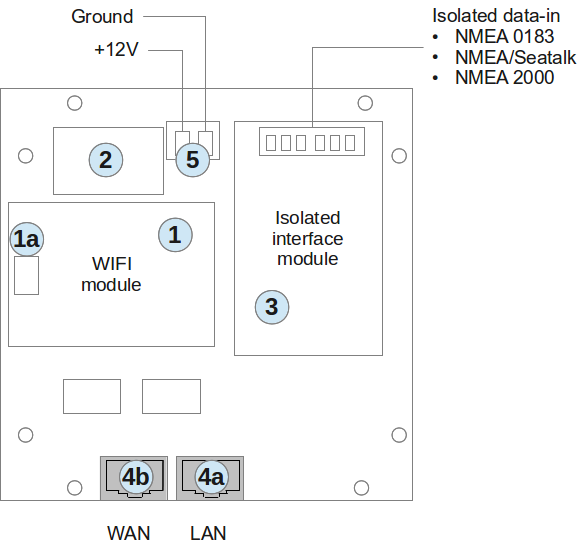 4a Ethernet module/jack by default configured for cable bound LAN access to marine data. 4b Ethernet module/jack by default configured for WAN access. Connect this jack to an active internet connection. The vYacht WiFi Router will automatically share internet and marine data via wireless. Drop-cables either come as male/female or male/open-ended. The male/open-ended drop cables fit the screw terminals on the vyacht router. Male/female drop-cables can also be used as backbone cables. For details please refer to the manual. The router should be installed into a dry place. The first step is to connect the power supply to the 12V board net. This can happen either by attaching the router to the 12V (cigarette or charger) outlet or by directly adding wiring to the main switch board. Make sure to protect the router with a fuse. For fixed installations it is recommended to attach the router to the same switch/fuse that other the navigational instruments share. If you are using an iPad then its now time to set up a new WiFi connection. The name of the access point is "vYachtWifi". Now open for example iNavX, select the instruments setup and set the server to "vYachtWifi" in the network connections (TCPI/IP) as well. After a sucessful connection to the vYachtWifi router you will see raw NMEA messages in the console window. For a good reason all producers of marine instruments and charting plotters have a disclaimer. No hardware or software product is error free. GPS data can be error prone and unreliable at times. Wireless connections transfering the data can be disturbed at the most stressful moments. Charts and electronic charts contain errors. Even the most precise electronic charts may be based on 100 year old depth data measured with a pole from a moving rowing boat. Distances were measured with a watch while rowing the boat at a constant velocity. The software in this vYacht WiFi router is based on Linux (OpenWRT) and gpsd. The hardware schematics are licensed under the Creative Commons Attribution-NonCommercial-ShareAlike 3.0 Unported License and actively developed by me on github (github). Sometimes wifi just doesn't want to come up. The router has a small computer built-in (System on a Chip) which takes some seconds to boot. While the power light seems to be permanently on there still might be spikes or small break downs causing issues. The most common source of power and resulting wifi issues is shared power with anchor winches, autopilots or trying to power the router from a Seatalk bus. 0. Detach all signal cables from the router while testing. 1. Please make sure to have a dedicated power line from the battery via a fuse to the router (obviously its okay to take it in parallel to other instruments from the power panel). 2. Do not power the router from the Seatalk bus directly. 3. Often an autopilot or an anchor winch is a problem because they impact the power on board. In this case 1) is very important. 4. Make sure that the wifi module really sits tight. Just press it down to make sure. 5. Completely unscrew the terminal screws and tighten them again. Often the wires end up in the wrong part of the terminal. Make sure to download the latest version for the correct router. Have a stable power supply and ideally disconnect all NMEA/Seatalk devices. Any interruption of the upgrade may result in an unusuable router. While not damaged they will need special tools and Linux experience to recover. Watch LEDs during the upgrade. They must go off and come on again before its safe to use the router again. That may take several minutes. Download the latest version for your router to your laptop/PC and store it locally. Connect the laptop/PC to your router. Go to the "Update" section of the configuration page. Hit the "Browse" button and select the downloaded file. The click the "Upgrade" button. Latest version always contains fixes and new features from all previous versions. Seatalk's raw (w/o GPS fix) longitude values indicating west were falsely reported as east. This was fixed. UDP broadcasts of NMEA 0183 sentences are now available as a new (experimental) feature. This way the router will support Navionics' Sonar Charts Live and should work with MacENC and some other soft- and hardware. The configuration happens through the router's configuration page. Just enter "*:2000" into the corresponding configuration field and all NMEA0183 sentences (translated and original) will be broadcasted via UDP on all ethernet and wifi interfaces. Certain Seatalk sentences received during a short period when restarting the router could result in the router to become permantently inaccessible via wifi or ethernet. Another restart and disconnecting from Seatalk would make the router accessible again. This was fixed. It is now allowed to disable the NMEA 0183 output. Its is now possible to disalbe/enable each NMEA 0183 / Seatalk input individually for being repeated / translated on the NMEA 0183 output. 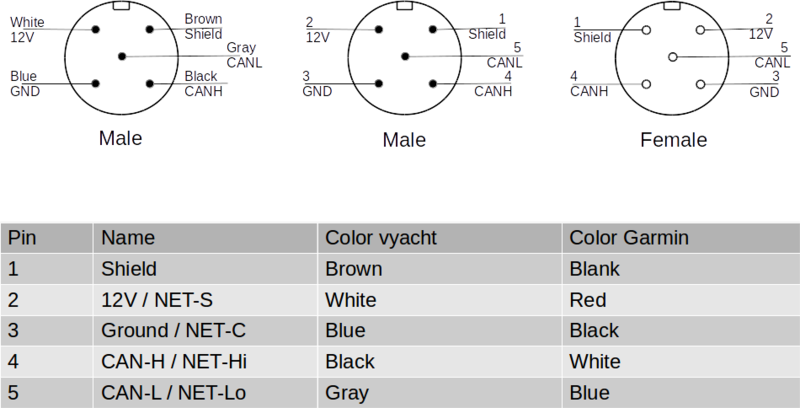 Previously only translated Seatalk sentences would go to the NMEA 0183 output. Some sentences would be written to the NMEA 0183 output twice. This is fixed now. The number of clients connected to the router is now limited to 16 for performance reasons. Raystart 112/120/125 and other Seatalk GPS only emit a timestamp every 10 seconds. This would result in internal and translated position data being reported with the same timestamp for 10 seconds before then stepping by 10 seconds. 1.3.5 improves this behaviour by adding an artifically calculated timestamp to each incoming Seatalk position report. The new timestamp is calculated based on the time difference to the last GPS time report. Likely resulting in some 2-3% jitter which sounds acceptable for this type of GPS. A test.html page was added to better debug incoming Seatalk data and see its NMEA 0183 translation via a browser.